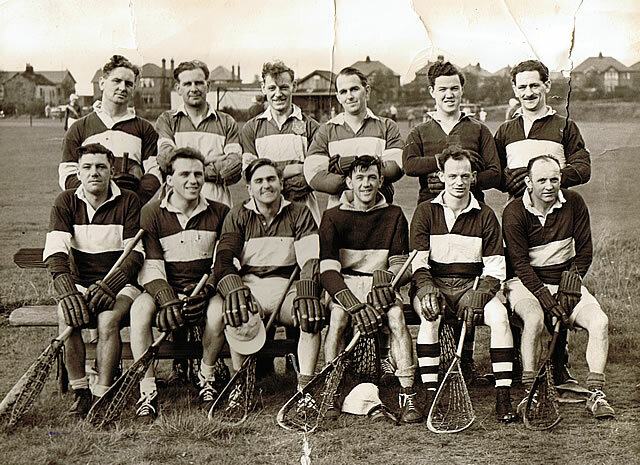 Webmaster’s note: This is a brief history of Offerton (later to become Poynton) Lacrosse Club. It has been gathered together by way of many old photographs, membership books and club correspondence collected over the years and which is looked after on behalf of the club by Howard Smith. We have recently been archiving some of the older material which we hope you will find interesting. We have some more from the 1970's/ 80’s and 90's and are building up a complete history of the club through to the present day. Did you play for Offerton / Poynton? - If you have any old photographs, memorabilia, or a few memories that you can jot down we would love to feature them on the website. Please contact us, or leave a message in the the comments box below. 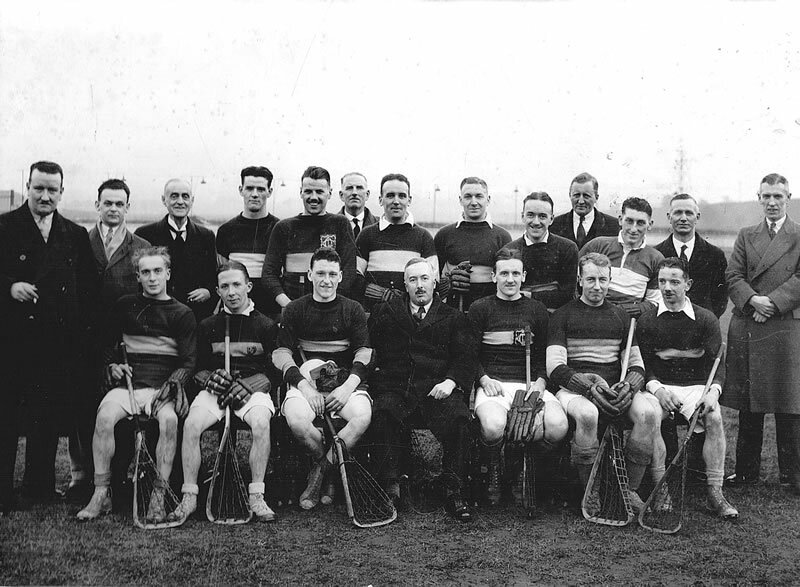 The lacrosse section of Poynton Sports Club was formed in 1973, but the club itself was founded in 1889 as Offerton Lacrosse Club. 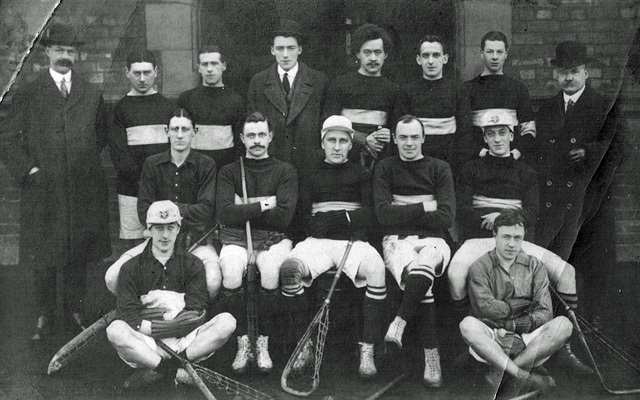 By the mid to late 1800's, interest in the sport was growing, influenced mainly by a series of exhibition tours by Canadian teams who had travelled to Britain to organise exhibition matches. 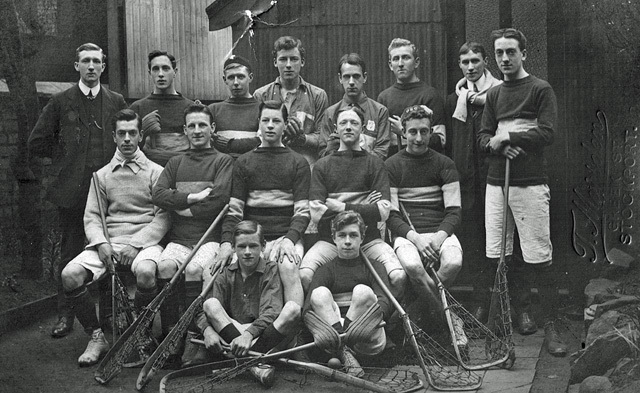 Later similar tours included Native American teams and such was the interest created that many lacrosse clubs were established in and around the Manchester area, several of which still exist today. "Birch V. Offerton. Played at Birch. 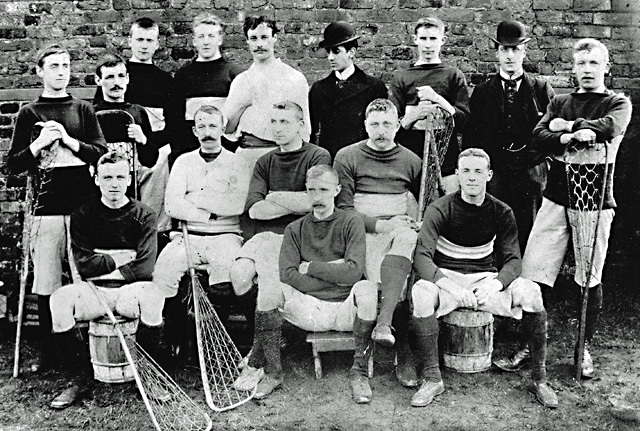 A very one-sided game ending in the home team's favour by sixteen goals to nil" "The newly-formed Offerton Club at Stockport is composed, with one or two exceptions, of players who have never handled a 'crosse before, and although the result of their first match was so disastrous, they must not be discouraged, but continue to practise, and for the present, at least, be content with sides games". 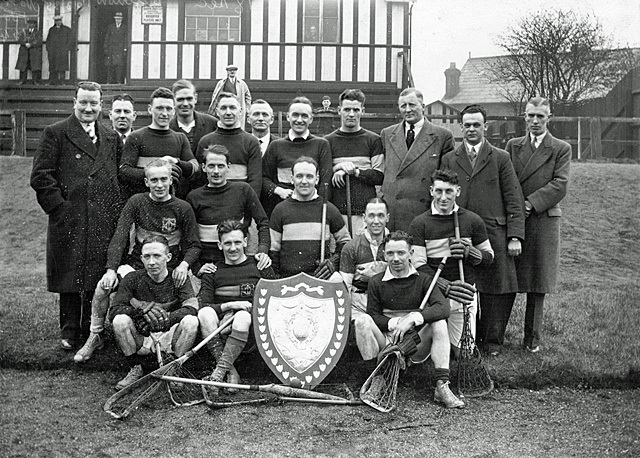 Despite a shaky start, support for the Club was obviously developing strongly, so much so that Offerton became a member of the North of England Lacrosse Association in 1890, and in 1893 was a founding member of the Cheshire County Lacrosse Association alongside the clubs of Stockport, Cheadle Hulme and Birkenhead. In 1895/96 the Offerton First Team won the North of England Division 3 title, followed by the Division 2 title for the 1898/99 season. 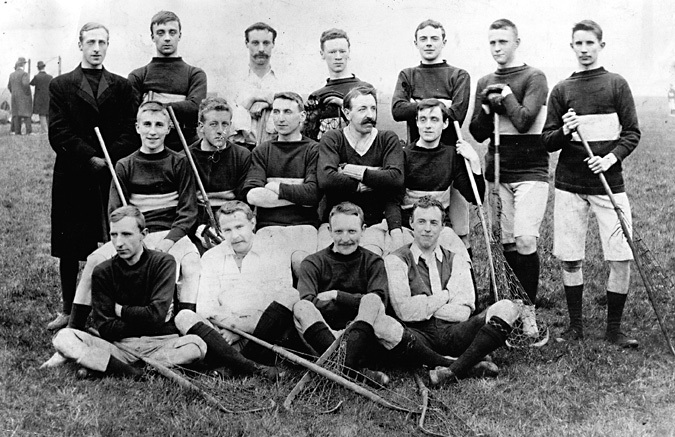 A team picture from the turn of the Century. Another picture taken around the turn of the Century. Probably taken outside a pub (notice the beer keg seats!). 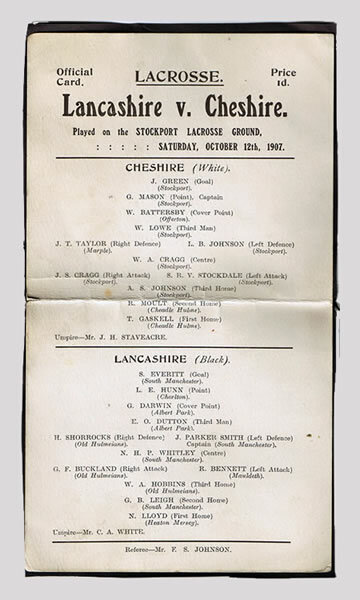 An early Lancashire vs Cheshire match programme from 1907. Offerton player W. Battersby at Cover Point. All sung with appropriate gestures!. Apparently, the second verse is just hummed with the same gestures but a little more exaggerated!- When they returned after the war they continued the song as a way of recalling their camaraderie and also in remembrance of those from the Club that lost their lives. As an aside, the Club has the minute book that closes on one page at the last meeting before the league was suspended for the war period. When the next page is turned, four years have passed and the club only has a handful of members left- quite a poignant example of the effect of the war on our own Club and no doubt many others throughout the country. 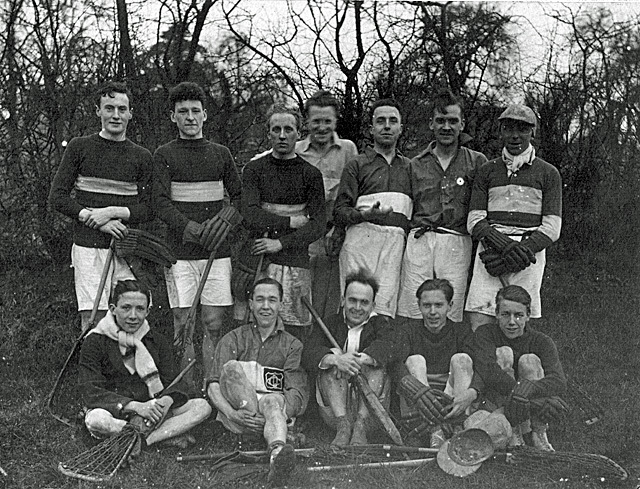 Throughout the 1920’s the Club was still very active, playing matches it would seem at various locations in the borough. 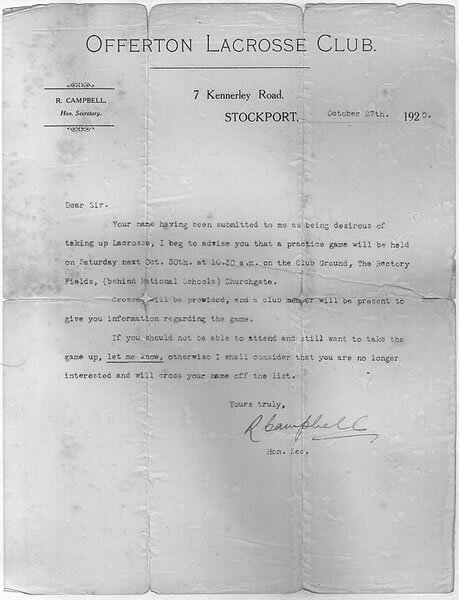 Correspondence from 1920 shows that the Club Ground at this time was The Rectory Fields (behind National Schools) on Churchgate, Stockport (quite a walk from Offerton!). By 1926 though, the Club had a new ground at Offerton Fold. Team colours (which seem to have stayed constant throughout the history of the club) were Navy Blue shirts with White centre band and white shorts. The highlight of the decade was to be in the 1928/29 season when Offerton beat Old Waconians to win the North of England Junior Flags competition (please see the gallery for pictures and a cutting from the Stockport Advertiser). 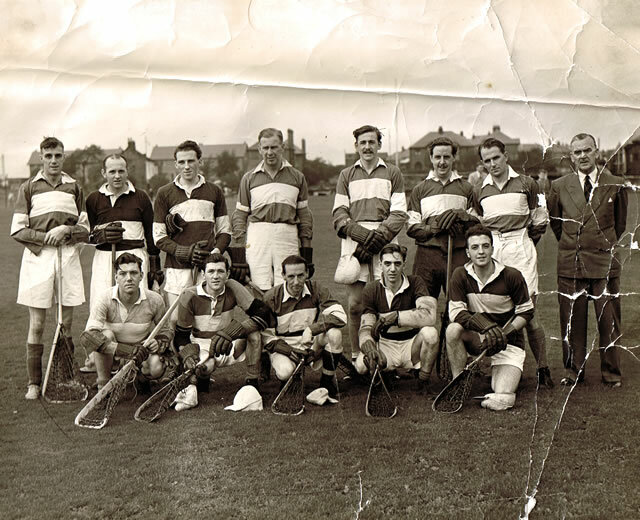 A letter from the then Club Secretary, R. Campbell regarding trying out lacrosse at Offerton. No date on this one, but we think this may be from the early 1920's. We're not sure of the year of this one, but possibly late 1920's. 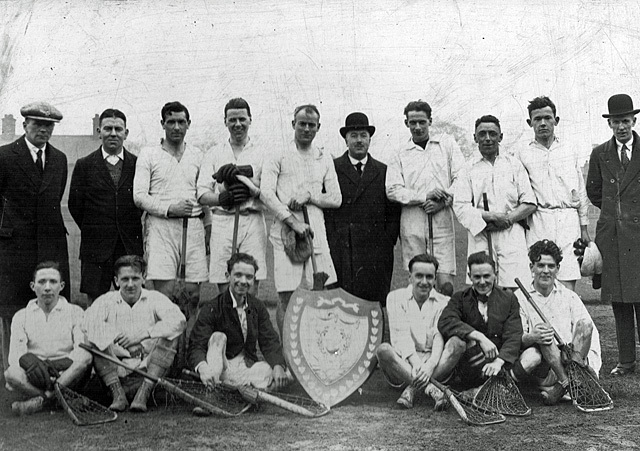 We think one of the players in the picture may be Harry Westhead. 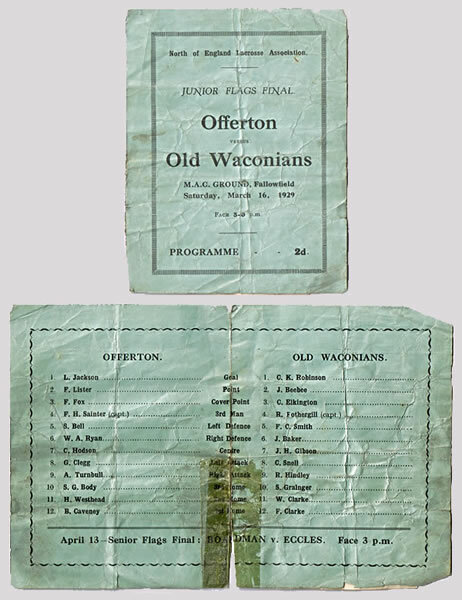 Offerton vs Old Waconians, Saturday March 16, 1929. 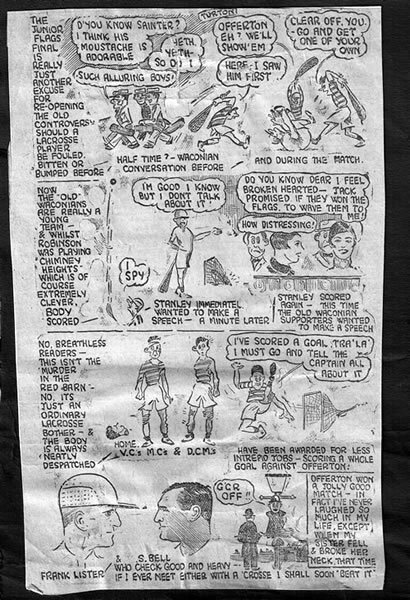 A cartoon from the Stockport Express in the build up to what was obviously a very eagerly anticipated Flags Final game! 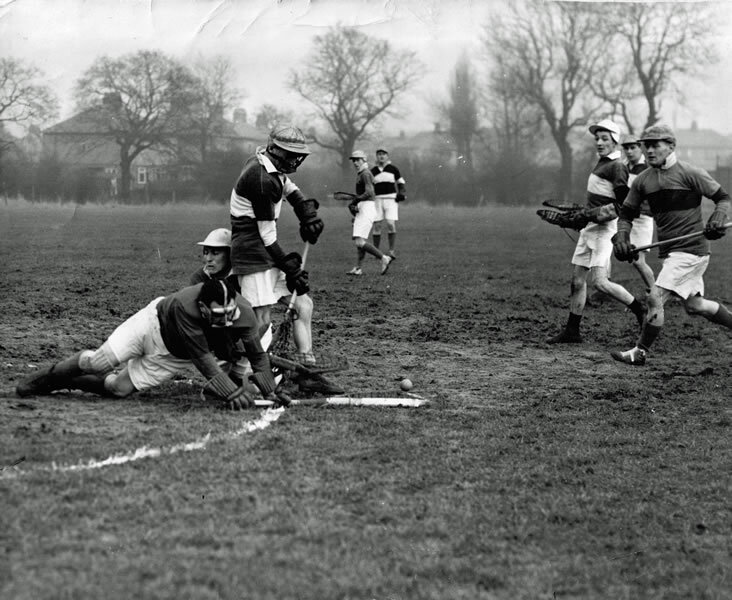 The 1930’s brought more home ground changes for the Club with some matches being played at Stockport Cricket Club at Cale Green (Stockport Lacrosse Club’s ground). Later in the decade the club’s headquarters would be at the Blossoms Hotel, on Buxton Road, with a ground at Bean Leach Lane, Offerton. Interestingly, the 1937 Club yearbook notes that the changing rooms were to be at the Royal Oak Hotel on Commercial Road, Hazel Grove, an easy walk for a quick pint or two after a home match! Club Secretary, Howard Smith notes in his feature ‘From Flying Fists To Drake’s Ducklings’ that the 1933-34 season almost saw the end of the club after an incident during a match between Offerton and Old Hulmeians which saw the Club suspended for the remainder of the season and all results expunged from the records, with no right of appeal. 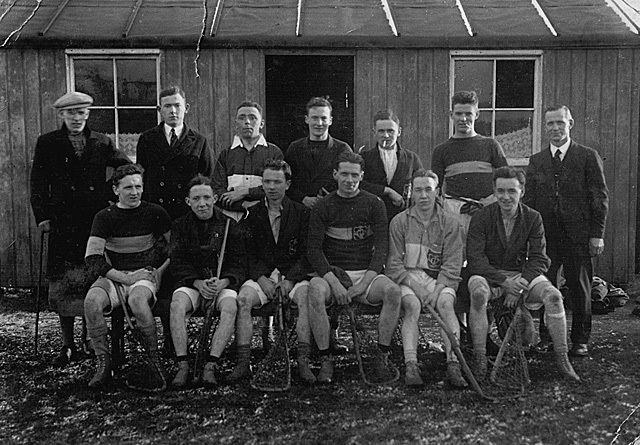 The Club carried on though, and with typical resolve went on to win both the 2nd Division Championship and the Junior Flags Competition the following year. After the War, the Club continued to develop, though still had no permanent base, playing home games at Woodlands Paddock, Offerton. Club headquarters however was still the Blossoms Hotel as it had been since the 1930’s. 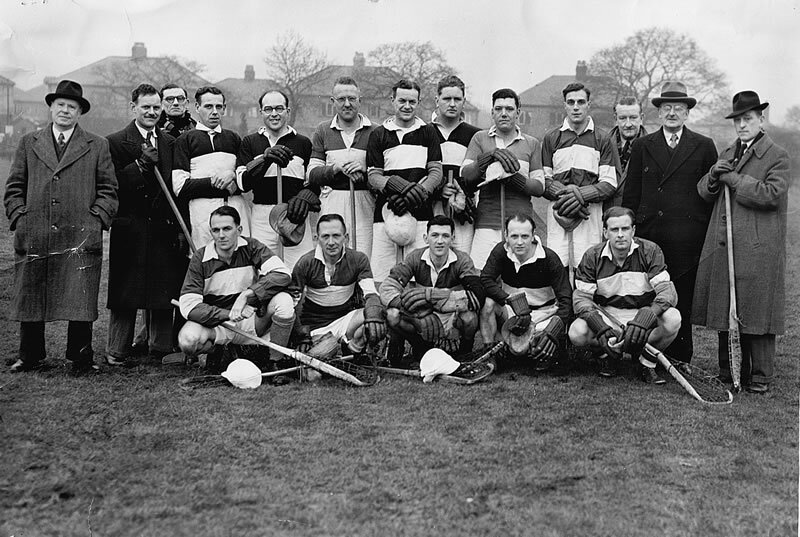 For the 1950-51 season, Offerton’s First Team played in the North Of England Lacrosse Association’s 2nd Division, meeting up with now long disbanded clubs such as Urmston, South Manchester and Wythenshawe, Chorlton and Leeds, (though many current clubs also appear in the early 1950’s fixture lists including Old Waconians, Mellor, Heaton Mersey and Heaton Mersey Guild). 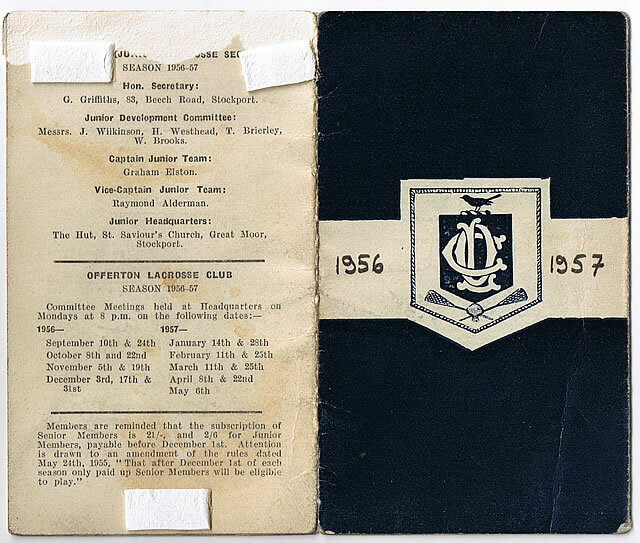 The 1950-51 season membership book notes that current Poynton Club member George Mathews was ‘A’ Team captain, whilst the First Team captain was Harry Westhead, an Offerton Club member for many years. Indeed the 1950-51 season was to be a memorable one. In the Club’s Diamond Jubilee year, the First Team won the 2nd Division Championship, whilst the ‘A’ Team won the 4th Division title. The First Team also had further successes, winning both the Junior Flags Competition and the Stockport Cup. By 1953, the Club had moved grounds again, this time to the Stockport Sunday School Athletic Association Ground, on Nangreave Road, Stockport. The long-standing attraction of the Blossoms Hotel as a headquarters had seemingly waned, and club meetings now took place at Stockport Cricket Club. 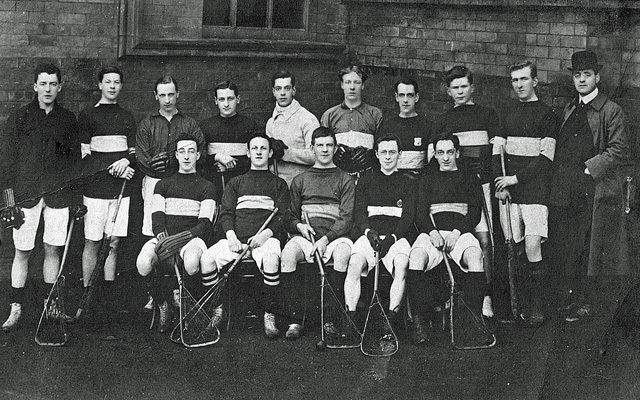 The First Team played in the 1st Division, whilst the ‘A’ Team contested the 4th Division honours. The 1954 season saw the establishment of a Junior section spearheaded by Geoff Griffiths and Trevor Brierley. Also involved in the Junior Development Committee were Bill Brooks and club stalwarts Harry Westhead and Jack Wilkinson. Though early successes were few and far between, enthusiasm abounded and by the start of the 1955 season Offerton Juniors numbered some thirty-three members, enough for two full sides of Under 15’s, and requiring a separate Junior headquarters at The Hut at St. Saviours Church on Great Moor. The development of the Junior section immediately paid dividends, with keen youngsters competing for senior squad places as soon as they were of age, and 1956 saw Offerton’s ‘B’ team take the 4th Division title, whilst the First team again won the Junior Flags competition in 1959. Throughout the period Offerton players were present in Cheshire county sides, with four players on the team that took on a Washington & Lee University overseas touring side in 1956. 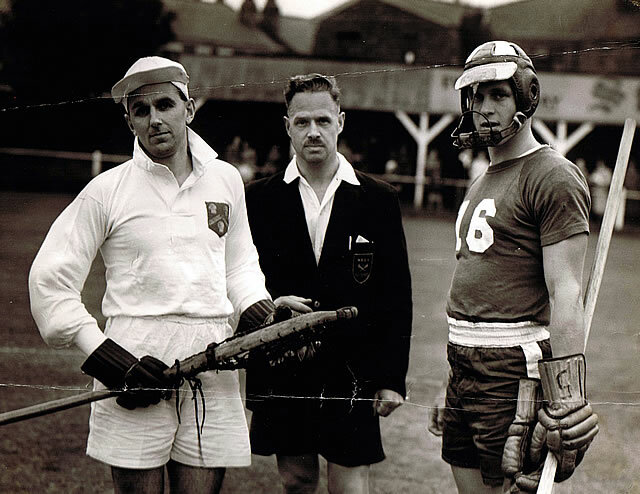 On that occasion Offerton’s C. Ward captained the Cheshire team whilst Cub Vice President Jack Wilkinson also served as the President of the Cheshire County Lacrosse Association (whilst still turning out regularly for the Offerton First Team!). Overall, the 1950’s was period of growth for the Club which had by now been established almost 70 years. The now familiar Blackbird appeared in the logo for the first time at the start of the 1955 season, and the Club became one of the first to produce a regular newsletter (the aptly titled “Offerton Blackbird”) at the same time. 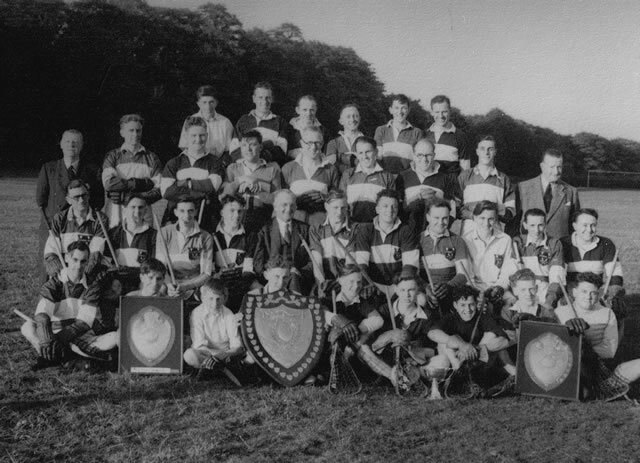 Offerton's 1950-51 Junior Flag's Final winning team (beating South Manchester and Wythenshawe). Front Row: C. Ward, H. Westhead, R. Kershaw, T. Heald, P. Addison. Centre: S. Anderson, F. Quigley, W. Garrett, J. Wilkinson. Back : E.C. Brooks, R. Leach, S. Hepple, C. Jackson, A. Whitnall, S. Ridgeway, T. Leach, W. Brooks, G. Kershaw. 1956-57 Season Club Membership Book. Club colours (navy blue with a white centre band) and the Blackbird in the logo. 13 July 1956 at Stockport Cricket Club. Cheshire Captain was C. Ward of Offerton, Washington And Lee Captain was Carl Baily. We think the Referee in the picture is Mr. G.E. Payne. The success of the previous decade continued with the dawn of the 1960’s. 1961 saw the Offerton First Team take the 2nd Division title, whilst the ‘A’ team took the honours in the 4th Division. 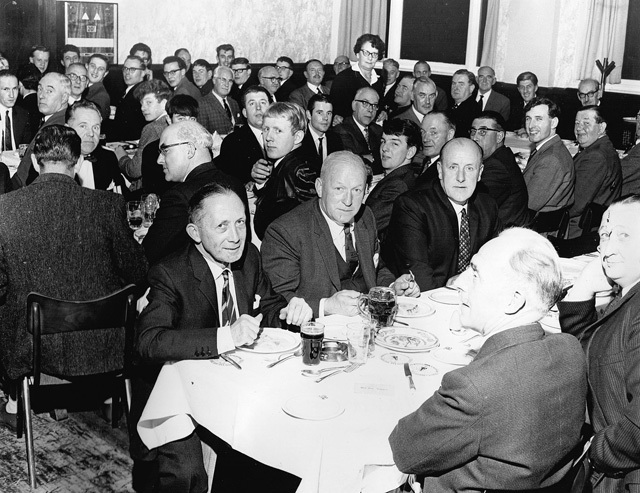 Sadly, no other league championships came Offerton's way throughout the rest of the decade, but the Club celebrated its 75th Anniversary in 1964. Headquartered still at Stockport Cricket Club, Cale Green, Offerton also played games there as well as at Offerton Girls Secondary Modern School (later to become Offerton High School). 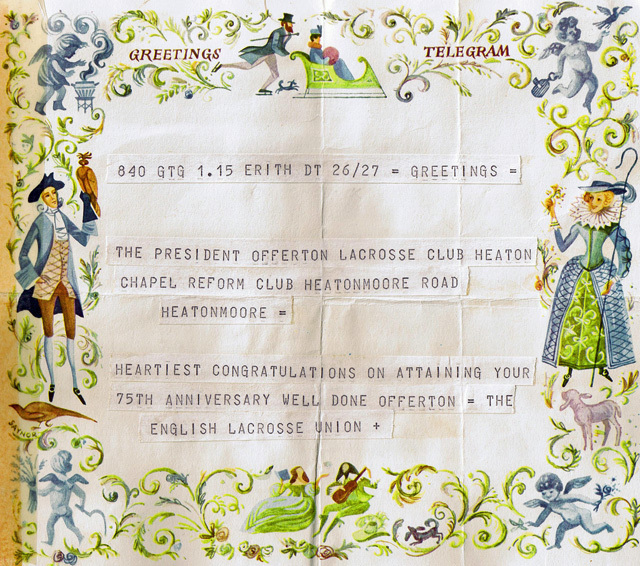 Telegram received on the occasion of the Club's 75th Anniversary in 1964 from the English Lacrosse Union. 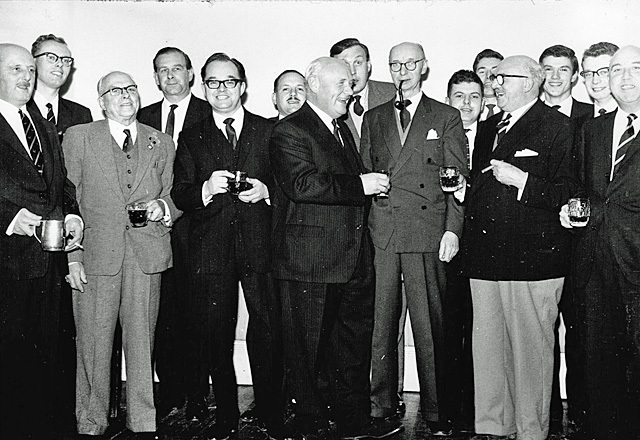 75th Anniversary Dinner held at the Heaton Chapel Reform Club, Saturday 31st October 1964. The President of the club at this time was Bill Brooks. 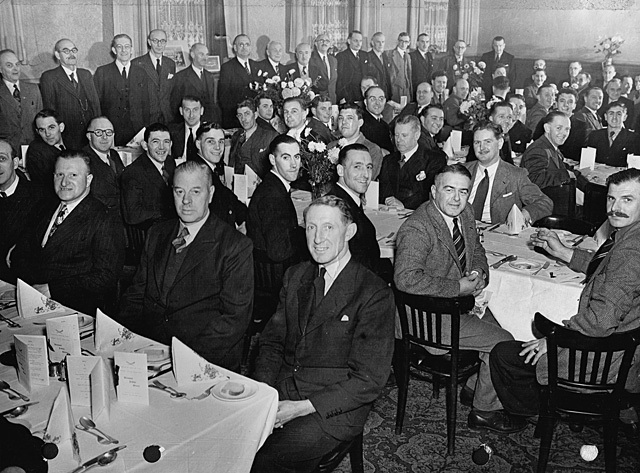 The Club's Diamond Jubilee was celebrated on Saturday October 28th 1950 with a dinner at the White Lion Hotel. A picture from a Club Hot Pot Supper at the Five Ways Hotel, Hazel Grove. Saturday 30 October 1965. 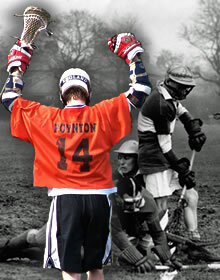 Offerton Lacrosse Club became the lacrosse section of Poynton Sports Club in the 1972-73 season. We will have more information/pictures soon.